Mendham Borough Hall is located at 2 West Main Street, Mendham, NJ 07945; phone: 973-543-7152. Photo: David Thompson House, ca. 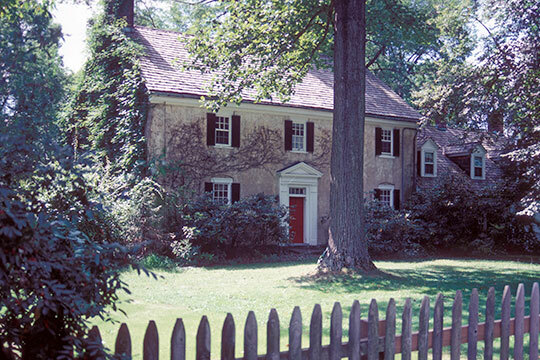 1770, 56 West Main Street, Mendham, NJ. Listed on the National Register of Historic Places in 1973. Photographed by User:Jerrye & Roy Klotz MD (own work), 1970, [cc-by-3.0 (creativecommons.org/licenses/by/3.0)], via Wikimedia Commons, accessed April, 2013. The Borough of Mendham, New Jersey is a community where time seems to have passed more slowly than in other parts of the County. Protective of its character, its streetscape, its development, and its residents, Mendham is a semi-rural, residential community where the names of its founding families have become the names of many of its streets, where homes sold are often referred to by the last name of the seller rather than by the street address, and where children often return to raise the next generation. Incorporated on May 15, 1906, Mendham Borough occupies only six square miles. It is served by two main roads: Main Street that runs between the Mendham Township lines on both the east and west sides of town, and Mountain Avenue/Hilltop Road that runs from Mendham Township on the north to the Bernardsville line on the south. At the intersection of these roads (one of only two signalized intersections in the Borough) lies the heart of this community, where several of the Borough's landmark white buildings welcome residents and visitors. Among these are the historic Phoenix House, the Black Horse Inn, Robinson Drug Shop, and One East Main, all dating to the beginning of the last century or earlier. Home to a slow growth population of 5097 residents, Mendham Borough is a largely residential community of homes on land parcels ranging from 1/4 acre lots to over 25 acres. With few existing lots available for development, Mendham Borough can best be described as a nearly built-out community on the verge of rebuilding. Borough of Mendham, Master Plan, 2006, www.mendhamnj.org, accessed August, 2013.